John Deere adds a dump-from-the-seat, hopper-style material collection system to its line of 7-IronTM Material Collection Systems (MCS) for 2006. Professional landscape contractors can increase productivity by emptying the large 500-liter-capacity hopper without leaving their seats, and a common three-bag mounting system allows quick, no-tool removal. As part of the 7-Iron MCS line—which includes the two-bag, three-bag or new dump-from-the-seat-style material-collection systems—all 2006 John Deere commercial mowing products also feature a redesigned spindle-driven blower. The new horizontal-mounted blower offers steel housing and greater ground clearance to ensure superior performance in all conditions. Newstripe now offers the Hashmark-Master. This innovative product paints hash marks faster than many other methods. Plus, it is a one-man job unlike using heavy templates that require a two- or three-man crew. The rugged Hashmark-Master easily can pay for itself during the first football season. The unit simply attaches to any Newstripe field-marking machine. The operator follows the automatic lineup guide from one hash mark to the next, paints it and moves on. It is that simple. No more measuring or using messy templates. Your hash marks will be perfectly laid out and painted every time. AerWay manufactures a full line of turf aerators ranging in width from 4-foot to 15-foot folding units. AerWay produces three-point and pull-type aerators with one of four tine solutions: the Shattertine, Sportstine, Finetine and Coring Tine. Each of these Tine Systems is a custom solution for your particular turf requirements. AerWay also offers the Greens Express Smoothing Roller as an option on all of its machines. This roller can be used in conjunction with a Deep Tine Aeration or on its own to smooth turf areas. AerWay also offers a full line of specially designed turf harrows and carriers. 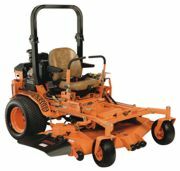 Few products have ever had such universal appeal as the ProMow Reel Mower System. Whether it's grounds crews who want to save time or coaches who seek to have their baseball, football or soccer field looking like a professionally manicured stadium, the ProMow provides an effective solution, saving both time and money. Keeping sand areas clean is important to beaches, waterfronts and other sand environments for health and hygiene purposes. The Nolte Bc1000 sand cleaner is an easy-to-use, multipurpose, motor-driven unit that removes all types of pollutants in small and medium-size sand areas like beaches, waterfronts, horse tracks, playgrounds and golf-course bunkers. Collected waste and rubbish are automatically transported to a collecting bin for easy removal. Lightweight and easily maneuverable, the Barber Sand Man operates in a variety of sand conditions and applications, including infield maintenance, playgrounds, volleyball courts, golf course bunkers and beaches. It is so compact it can be transported to various locations in the bed of a pickup truck and is light enough to be unloaded by one person. The Sand Man is equipped with three different size screens, which allows it to work in a variety of sand and soil conditions. It can remove the smallest of debris including broken glass, plastic, cigarette butts, pop-tops, shells, stones and wood. Productivity is top priority with the Scag Turf Tiger Zero-Turn Rider. Its low center of gravity and maximum maneuverability allow positive traction on all kinds of terrain. The Tiger's quick ground speed (10.5 mph on smaller models, 12 mph on models with 29 horsepower or larger) and 10-gallon fuel capacity help you get more done in less time. The 29-horsepower and larger models also include a suspension seat, so you stay comfortable all day. The dependable, double tube frame and tough drive shaft system ensure reliable, long-lasting service, and units include a full ROPS (roll-over protection system) and cup holder. Kromer's Athletic Field Maintainer is a multipurpose machine that has the ability to apply dry and wet lines, groom and condition, aerate, spray, cut, and paint a line at the same time, all in one easy-to-use machine. This effective multipurpose maintainer is just one of Kromer's many specialty products to help you "maintain the dream field." Kromer also carries a line of push liners, trailer groomers and the innovative Field Paint Mixing Station.